The #BernieOrBust movement is is full swing even though Sander's chances of winning the nomination are slim to none at this point. 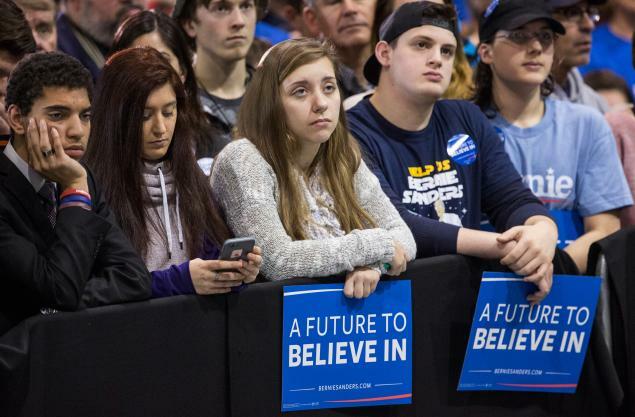 The Sanders supporters drone on about what they believe is Hillary's dishonesty, her ties to Wall Street, things she said as First Lady and anything else they can pull out their asses as reasons that they can not now or ever vote for her. Well I have four very good reasons why Sanders supporters should get over their disdain for Hillary Clinton, go in the voting booth, hold their noses, and vote for her. * Supreme Court Justice Anthony Kennedy is 79 years old. * Supreme Court Justice Ruth Bader Ginsburg is 83 years old. While we know the next president will appoint one judge to replace Anton Scalia, we also have to realize that due to the ages mentioned above three other seats could open up due to retirements or death. Let me ask you angry Sanders supporters something. Do you want President Trump or Cruz making these appointments? Do you want what progress has been achieved to be overturned? Do you hate Hillary so much that you are willing to jeopardize all the rights mentioned above? Please, put what you claim you stand for above what you feel toward Hillary. You will get over your hurt feelings being; the country may never get over a Supreme Court dominated by conservatives.